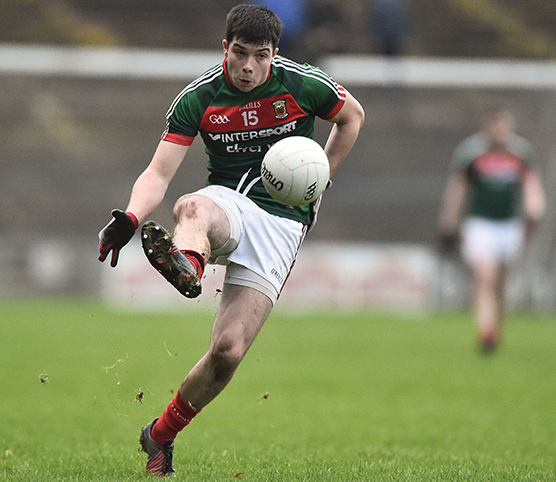 Brian Reape playing for the Mayo in a preseason match. DCU moved through the gears to advance in to the Sigerson Cup quarter finals after a comfortable win over IT Carlow in St Clare’s last night. DCU led from the off with Brian Reape scoring the only goal of the game from the throw in, after a long ball from Dara McVetty resulted in the towering full forward to slot the ball into the bottom right hand corner of the net. DCU would hold this lead throughout the course of the match. A repetition of long balls into the forward line and good link up play with the midfielders resulted in two early points from centre half forward Michael Bannigan and full forward Brian Reape. It took IT Carlow a total of eight minutes to win a kickout and ten minutes to finally make it onto the scoresheet with a point from the Offaly native Jack Walsh. This would be their last score for ten minutes and their first out of three points in the half. DCU never seemed to panic, with Brian Reape adding to another point from a free after corner back Conor Morrison drove through the heart of the IT Carlow defence to buy himself a free. This quickly followed for Reape to fire home a second goal only to be denied by goalkeeper Declan Campbell of Kildare who pulled of a magnificent save. IT Carlow found it almost impossible to break down the DCU defence with some superb tackling and discipline from Brendan McCole, Kieran Dwyer and Des Reynolds. Noel Gately did find a small gap to fire home a beautiful long ranged point to keep any hope IT Carlow had in this match alive. The lead was growing larger. Extremely fast passages of football found it difficult for IT Carlow to stay in anyway near touching distance. Final long ranged scores from Luke Towey, Matthew Ruane and David Garland seemed to be sending DCU to the dressing room at half time relaxed with smiles on their face. That was until the last play of the half which ended in a collision, resulted in DCU midfielder Thomas Galligan being shown a black card and sent to the line. Trailing by 11 points at half time everyone thought IT Carlow were out of the game, however 7 second half points from substitute Diarmuid Whelan put them in a very dangerous position of stealing the game from DCU. DCU were able to score six points in the second half with all six forwards finishing the game on the scoresheet from play. An error from the DCU full back line almost resulted in goalkeeper Evan Comerford being chipped by Conor O’Toole but to their delight, the ball skimmed over the bar for just a point. Some fine points from corner forward Noel Gately and Niall Hughes were not enough as DCU’s Dara McVeety and Matthew Ruane finished the scoring to send DCU into the quarter finals with a five-point win at home. DCU: Evan Comerford; Conor Morrison, Brendan McCole, Kieran Dwyer; Cian McManus, Dara McVeety (0-02), Des Reynolds; Thomas Galligan, Matthew Ruane (0-02); Shehroz Akram (0-01), Michael Bannigan (0-03), Luke Towey (0-01); David Garland (0-02), Brian Reape (1-3), Darragh Rooney (0-02). Subs: Tom Fox for Galligan (black card, 30), Jack Bambrick for Towey (48), David Marnell for Dwyer (48), Paul McNamara for McManus (52). IT Carlow: Declan Campbell; James Mitchell, Richard Hitchcock, Jack Casey; Conor O’Toole (0-01), Eoin Buggie, Trevor Collins; Sean Ryan, Niall Hughes (0-01); Tommy Griffin, Nick Doyle, Daniel O’Sullivan; Noel Gately (0-03), Brendan Carr, Jack Walsh (0-02). Subs: Padraig O’Toole for Collins (HT), Diarmuid Whelan (0-07) for Ryan (HT), Sean Crowly for O’Sullivan (48), Darren Lawler for Buggie (55).